Are you interested in U.S. coins, World coins or paper money? Often referred to as pennies (a throwback to our British heritage), cents were minted continuously from 1793 to the present day with the exception of 1815. The Mint was out of copper planchets for that year. Many of the early Large Cents (larger than a quarter and about twice as thick) are very rare and expensive. Small cents were introduced to the public in 1857. They are about the same size as today’s cents but a little thicker. In 1859 the Indian Cent was introduced and in 1909 the Lincoln Cent was introduced. The Indian and Lincoln Cents are widely collected by coin hobbyists. Many of today’s serious collectors started out with “penny” boards. We have a wide selection of cents on hand, from the least expensive to some of the more expensive ones. The name Nickel (5¢) actually was referred to a nickel 3¢ piece that was minted from 1865 to 1889. In 1866 the Nickel or 5¢ piece was born and is still minted today. The Nickel has had several different designs from its beginning in 1866; Shield Nickel (1866-1883), Liberty or “V” Nickel (1883 to 1912), Buffalo Nickel (1913 to 1938) and the Jefferson Nickel (1938 to present). Half dimes and dimes first started out as half dismes and dismes, a Latin word decimus or 1/10. They were some of the first coins to be minted. Many of the early dimes are very expensive. Along with other denominations, half dimes and dimes have had many different designs. Half Dimes were minted from 1794 to 1873 when the Nickel 5¢ became well established. Dimes were minted from 1796 to present with some breaks in continuity. Most novices to intermediate collectors collect Mercury and Roosevelt dimes (1916 to present). Quarters were first minted in 1796 and are still being minted today. There were many years that quarters were not minted; usually because of no demand, silver shortage or economic reasons. Most collectors today collect Washington quarters. 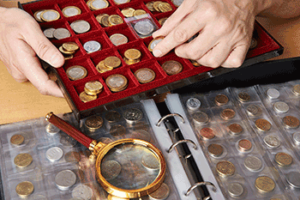 More experienced collectors look for Standing Liberty or Barber quarters. Those serious collectors look for Flowing Hair, Bust or Seated quarters. Half dollars were first minted in 1794 and are still being minted today. As with the quarters, there are many years when no half dollar was minted. Most collectors today collect Walking Liberty, Franklin or Kennedy Half Dollars. Serious collectors look for the Flowing Hair, Bust, Seated or Barber Half Dollars. The silver dollar is one of the most collected coins in US history. Minted from 1794 to 1935: they consisted of roughly 90% silver and 10% copper. The Morgan Dollar, minted from 1878 to 1904 and 1921, is in great demand. There is a group, Society of Silver Dollar Collectors or SSDC that collects and studies the Morgan dollar to great extent looking for old and new varieties. Some of the Morgan dollars are expensive on their own due to low mintage or condition, but some varieties are equally expensive. In 1971 the US Mint started producing dollars again, only there is no silver in them (with the exception of several ‘collector’ coins minted from 1971 to 1976). Several US Colonies issued paper money. The first official paper currency was issued in 1861 (???). Denominations are: $1, $2, $5, $10, $20, $50, $100, $500, $1000, $5000, $10000 and $100,000. The $500 to $10,000 denominations are not printed or circulated any more. The $100,000 notes were only used in transfers between banks. Although Herb’s Coins deals mainly in US coins and currency, we do have a small but impressive selection of foreign coins and currency. Prices range from .50 to hundreds of dollars and from many different countries, from all continents except Antarctica. Now we buy and sell Iraqi Dinar. If you have any rare or not so rare coins or currency (US or foreign) that you wish to sell, please come in and see us or call 941-629-5777 or by mail or e-mail. If you are looking to buy please visit us on eBay at herbscoinshop or at our retail store at 2348 Harbor Blvd, Port Charlotte, Florida 33952. We carry a good line of bullion material. We also do free appraisals!